We braved the night, with its tormenting mosquitos, for about ten minutes before my husband lovingly ran back home to fetch the bug spray. Ah, relief! 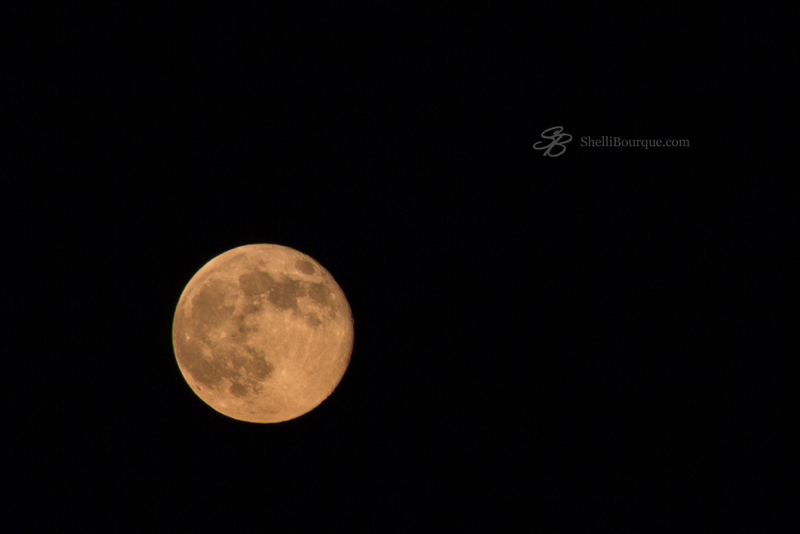 The super moon, with its soft orange glow did not fail to impress. And the last shot of the night turned out to be the best. After a few muggy summer days, our windows are open once again. I love the sounds of the birds singing and trees rustling. I’ll be spending the better part of the weekend wrapped up in homework, but will probably take a break to visit a local antique shop that I’ve always wanted to visit. I’ve seen the sign for years and just never took the time to check it out. Even if it’s a dud, my curiosity will be satisfied, and the short drive on our country roads is never unsatisfying. Is it OK for a Christian to drop OMG’s?
. . . perhaps God thinks you are a little “under-whelmed” with him. If you are carelessly and thoughtlessly dropping OMG’s then there is a glory gap that needs to be closed. I am the queen of throwing out, “Please let me know if there’s anything you need,” and now I realize that sentiment doesn’t cut it. In the past, even though my heart ached to help, throwing verbiage came easy, a cop out if you will. A person in crisis is in survival mode. Don’t place them in the difficult position of having to filter through and access what they need, followed by reaching out and asking. When life is swirling and one is just struggling to maintain, thinking through a list of past offers is nearly impossible and most people will never ask for help. If this is true, and I believe it is, Satan’s plan is not to redefine marriage but to destroy it. He hates marriage because he hates God and marriage is a godly thing. It was created by God to glorify God and to provide an ongoing glimpse of Christ’s relationship with his church. It strengthens families, strengthens society, provides the most natural context for spiritual growth and discipleship. It is inherently, intrinsically, all the way good. So why shouldn’t Satan wish to destroy it?